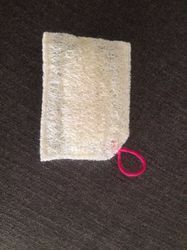 9cm diameter sisal fibre bath scrub/air freshener cover have one side open for yours choice. Put it favourite small bath soaps or herbs like vettiver for bath purpose. This cover use to air freshener also. Put it airfreshener and place it cup boards and rooms. It stimulates circulation and cleans the pores reactivating the weaker cells. It improves circulation thus bringing glow to skin. Our Natural Bath Scrub is made from Vetivert Root to give you that Extraaaa Scrubbbb. These are made by 'House of Harmony', an Auroville based unit. Due to the aids and expertise of professionals, we are extremely admired for presenting a superior quality of 12 Pcs Nylon Bath Scrub to our valuable customers. Gel Scrubs (500 ml each ) helps in getting rid off dullness, stimulates epidermal renewal and rejuvenates stressed skin to reveal a glow & radiance. Easy to use and carry. Acts on areas of importance to overcome breakouts, dehydration. Treats dead skin and leaves the skin soft.